The Twitter machine is a weird and glorious thing. When I started out on Twitter back in 2008, I couldn't see the point, or how it was going to work. Fast forward a few years, and I simply love Twitter. By carefully choosing who I follow, I have gleaned lots of valuable foodie information & tips. I've gotten to go to free food events and film screenings courtesy of several PR firms. I've also entered and won several cool competitions. The Irish food community has really taken to Twitter, with many food bloggers, restaurants and producers actively participating. It has produced some vibrant and interesting discussions, and Twitter is now my number one resource when I need suggestions or information. 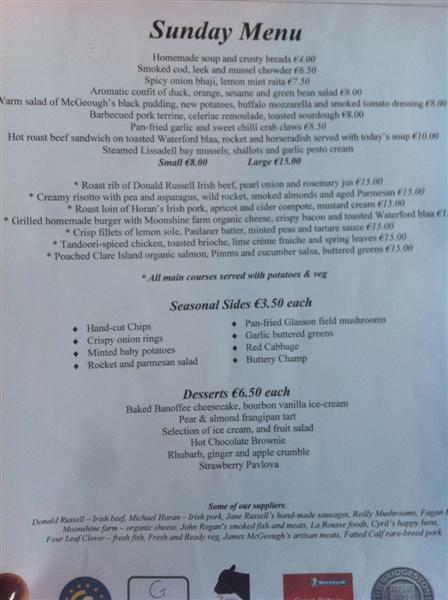 And so it was last Saturday when journalist Clare Kleinedler (@clairekleinedler and author of the blog An American in Ireland) tweeted that she was heading to the Fatted Calf in Glasson for dinner. This was a new venue to me, so a little bit of Googling informed me that not only was Glasson about 20 minutes from my hotel, but more importantly, it was run by Feargal O'Donnell (along with his wife Fiona), who was previously head chef at the nearly Wineport Lodge. Feargal is also currently Commissioner General for Euro-toques Ireland, so he is a man in the know when it comes to food. Glasson is a postcard-pretty little village (you will think Tidy Towns when you see all the flower baskets!) and the Fatted Calf fits in beautifully on the main sign. The sign outside promises BBQ and smokehouse, two words which always leave me in a state of breathless excitement. As we were a little early for Sunday service, we walked around for a few minutes. 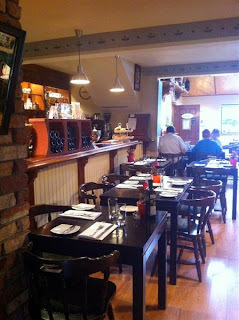 This lead us to the cosy outside eating area at the rear of the pub and the gorgeous Tamworth (and perhaps Saddleback?) pigs busily eating in a small paddock. Pigs, BBQ and smokehouse... this was starting to seem like a little piece of heaven. Inside, part of the old pub lounge has thankfully been left intact, but with the improvement of cushions and dancing cow ornaments! A larger and brighter dining area is to the rear which allows the venue to cater to different audiences. If you want to dine at the bar, the snacks menu offers tasty sounding onion bhajis and buttermilk-fried spiced chicken. (Makes a pleasant change from King crisps and Pringles). As it was Sunday, the menu on offer was a bit more traditional in style than the food still listed on the board from the previous night's specials. I was a little disappointed at this as I wouldn't be someone who goes out looking for a Sunday lunch. Too many bad carveries have left me with what borders on a pathological fear of lamp-lit roasts. 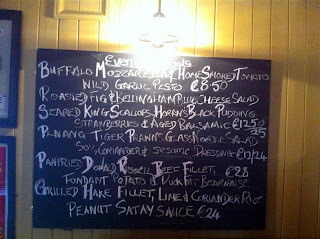 Check out the photo of the blackboard below for examples of evening cooking - I think that I could have happily ordered every dish on that menu. There was plenty of choice on the Sunday menu, which also listed the main suppliers used by the Fatted Calf. No messing around here when it comes to provenance. I decided to go for two starters so that I could sample a little more of the menu, while he opted for a main course only. I apologise for the lack of photographs, but the photos I took in the restaurant weren't really good enough quality to do justice to the food. While waiting for the first dishes, we snacked on some of the homemade bread left on the table, including a fruity brown Guinness & Treacle bread. Starter 1 - Warm salad of McGeough's black pudding, new potatoes, buffalo mozzarella and smoked tomato dressing (€8). The mozzarella was fresh and creamy smooth, the black pudding was smooth and spicy, but the real star of this show was the smoked tomato. It tasted as if it had been dipped in a turf fire and made a wonderful addition when chopped up and mixed through the salad. Starter 2 - Barbecued pork terrine, celeriac remoulade & toasted sourdough (€8). I received two pieces of bread, topped with generous scoops of pulled pork and a quinelle of celeriac remloulade. The pulled pork was mixed with a sweet BBQ sauce, and combined brilliantly with the mustardy, sharp celeriac. I love pulled pork, but it's not something that appears on Irish menus very much. 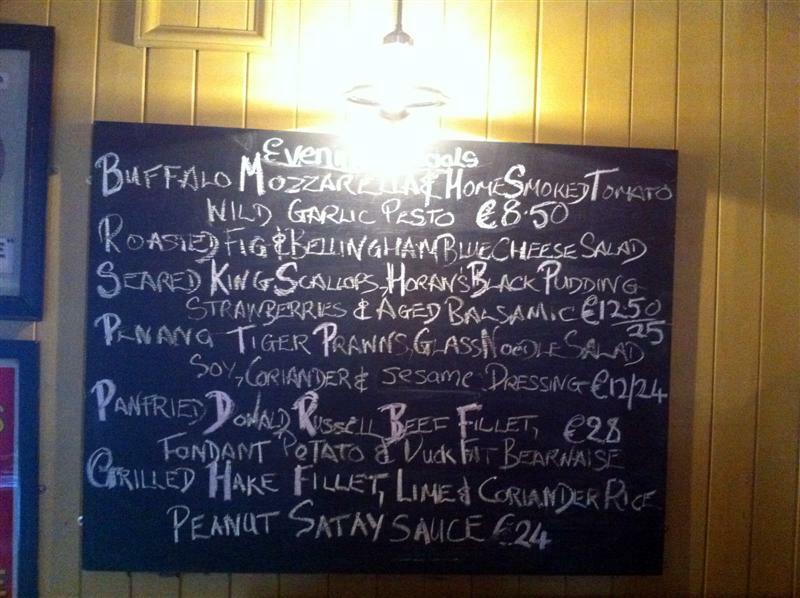 Roast rib of Donald Russell Irish beef with pearl onion and rosemary jus (€15). This came with a Yorkshire pudding with a roast potato cheekily ensconced in the pudding. Himself also ordered a side of the ahdn-cut chips (€3) to round out his dinner. This was an awesome plate of roast beef - it was very tender and tasty (despite being cooked through) and the decent hefty slice satisified his appetite. The accompanying roast potato was nearly as good as my mother-in-law's (trust me, she makes amazing roast potatoes) and the whole plate was cleaned down to the last crumb. I was in a state of bliss leaving the Fatted Calf. I wouldn't call it a gastropub, as I sometimes think that that particular title implies a sense of pretension or fanciness that is gladly lacking at the Fatted Calf. It's simply a bar that serves really good, creative food. Our total bill, including 2 coffees and 2 soft drinks came to €43. I'm already looking for an excuse for a return visit.